This indicator is available for 2011 for selected cities in the BSR, including Norway, Sweden, Finland, Russia, Estonia, Latvia, Lithuania, Belarus, Poland, Germany and Denmark. To date data are only available for 2011. 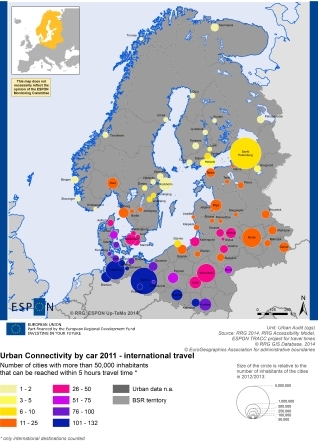 Data available for a selection of case cities in the Baltic Sea Region. Further data would be available for other cities in Europe with more than 50,000 inhabitants. RRG Spatial Planning and Geoinformation (RRG), via ESPON TRACC.